Good News!!! 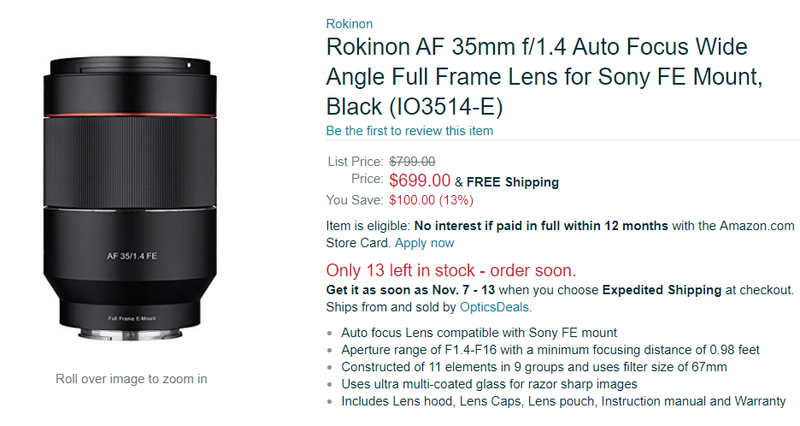 The newly announced Rokinon Samyang AF 35mm f/1.4 FE lens is now in stock and shipping for the first time at Amazon! Moreover, it costs only $699, $100 cheaper than the list price. This is the fourth autofocus lens line-up after Samyang AF 14mm F2.8 FE, AF 35mm F2.8 FE and AF 50mm F1.4 FE. This entry was posted in Samyang lens and tagged Rokinon AF 35mm F1.4 FE lens, Samyang lens on November 6, 2017 by admin.